Mysore is a city of yoga and spirituality. Having just finished my yoga training, I am sure that you could imagine my excitement at getting into the yoga scene here – instead I was quickly distracted by something that to me is just as interesting, the silk scene. 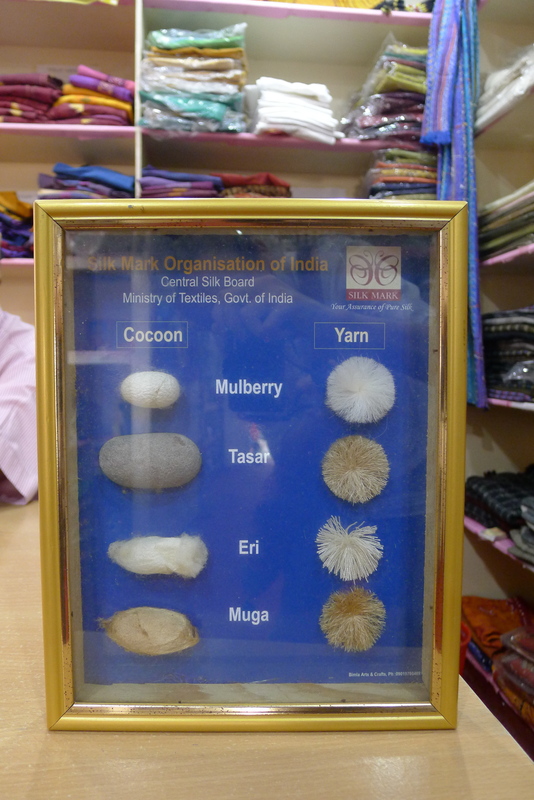 This is one of the several places in India where there is a long history of silk production. You can see it everywhere, in the advertisements, the stores, the saris the ladies are wearing as they do their afternoon shopping down the street. Silk seems to be woven into the culture here as surely as the strings of jasmine are woven into every woman’s hair. Silk production in Mysore is controlled by the government, which means that if you want to see the process you have to go to a government facility – so, government facility, here we come. Most of the silk worked in this area is mulberry silk, which is a strong, fairly white variety of silk with a longer staple (fiber length). The initial phases (and probably the most interesting parts) of the process are off limits, but the spinning and weaving are open for tours. Unlike silk production in some parts of the country, everything here is done by machine. As we walked into the spinning room, we were greeted by huge spinning machines and the whirl of pink (S twist) and green (Z twist) threads flying onto multicolored plastic spools. Speckled among the machines are women in beautiful blue floral saris slowly making their way around to see that everything is in order. Making our way into the weaving center, the dynamic totally changed. The thumping of heddles in the old Swiss and Japanese machines was deafening, and the beautifully dressed women are gone. Wooden pegboards are fed through the looms telling the heddles when to lift and lower to make the appropriate pattern. Hanging off the end of almost ever loom is a dirty button up shirt. And watching over the flying shuttles is a man on a stool. Weaving is a man’s world apparently, perhaps because they aren’t required to wear the cumbersome 6 meters of fabric a sari encompasses and can therefore easily bend over the loom. Even if walking through the factory could make us feel like we were back in England during the industrial revolution (or for me, back in undergrad), the gods won’t let us forget that we are in fact in the southern subcontinent. Watching over the whole operation is a myriad of Hindu gods. Each wall has its own image, and each image is surrounded by a string of flowers and blinking lights.